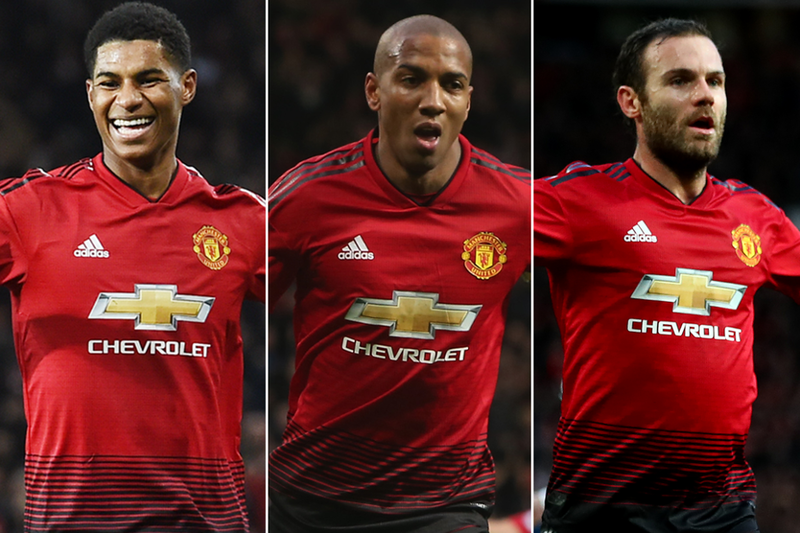 An emphatic 4-1 win over Fulham promoted the stock of some of Manchester United's differential options in Fantasy Premier League. Marcus Rashford (£6.8m), owned by 6.9 per cent of FPL managers, led the way with a fine 14-point haul. Juan Mata (£6.2m) and Ashley Young (£5.7m) also made Gameweek 16's Dream Team cut. The duo are found in only 1.1 and 1.3 per cent of squads respectively. 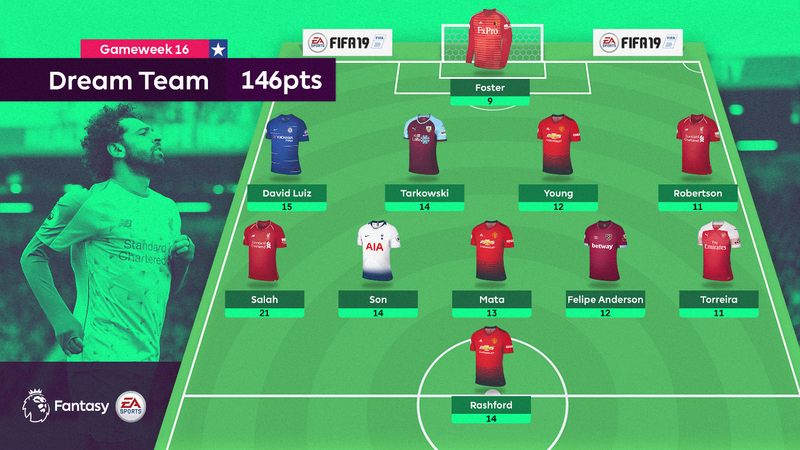 They line up in a 4-5-1 formation that produced 146 points - the second-highest Dream Team total of the season. Saving Gylfi Sigurdsson's (£7.5m) penalty in Monday night's 2-2 thriller at Everton helped the Watford stopper to his joint-best score of the season. The stand-out performer in Chelsea's 2-0 victory over Manchester City. David Luiz produced points from a goal, clean sheet and the maximum bonus award for his first double-digit haul of the campaign. The centre-half scored the decisive goal in Burnley's 1-0 defeat of Brighton & Hove Albion. Tarkowski's ownership has more than halved since Gameweek 7 but he rewarded the 4.1 per cent of managers who have kept the faith. An all-action display from the full-back involved a goal, an assist and a bonus point as Man Utd scored four goals in a league fixture for the first time this season. The Liverpool left-back's consistency has brought in 95 points, behind only Marcos Alonso (£7.0m) in the defenders' table, but this is only his second Dream Team appearance. Robertson kept a clean sheet and provided an assist as the Reds won 4-0 at AFC Bournemouth. The Egyptian made it five goals and an assist from his last five Gameweeks with a hat-trick at Vitality Stadium. His 21-point return took Salah to the top of the FPL player standings for the first time this season. Since returning from injury in Gameweek 11, the Tottenham Hotspur midfielder has been outstanding, accumulating 40 points. He scored and provided an assist in a 2-0 win at Leicester City to earn maximum bonus points. Used sparingly by Jose Mourinho, the Spaniard marked his seventh start of the season with a goal, an assist and three bonus points. His third double-digit score in six Gameweeks came courtesy of a goal and an assist in West Ham United's 3-2 victory over Crystal Palace. The talismanic midfielder made it two goals in three Gameweeks with an acrobatic winner for Arsenal against Huddersfield Town. That form, and his budget-friendly price, have made him Gameweek 17's most-bought player. The United forward scored one goal and set up another two against Fulham. Rashford has featured in every match since Gameweek 7, scoring three times and providing five assists.